Often called “bingo arms” or “bat wings”, loose, sagging and excess skin in the upper arms is often a result of significant weight loss but also can be part of the aging process. For most people, significant sagging skin and fat cannot be eliminated with diet and exercise. An arm lift, or brachioplasty redefines the arm circumference by removing excess skin and fat. “This procedure is a trade-off for patients as the scar is significant. Even with the scar, most patients are very happy with the changes and are able to wear the clothes that they like,” states Dr Ricciardelli. Is arm lift surgery for me? If you find that you are very self-conscience about your upper arm area because of sagging skin then may be a candidate for an upper arm lift. The best candidates for arm surgery are close to or at their ideal body weight. Dr. Ricciardelli will meet with you to discuss your goals and expectations to determine what procedure/s will be right for you. Yes. Most often this surgery is combined breast lift, tummy tuck, liposuction and other cosmetic procedures. Take advantage lower pricing and time spent away from work by combining procedures. Ask Dr. Ricciardelli about other procedures during your consultation. 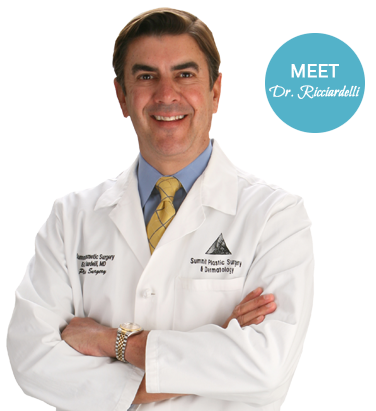 At your consultation, Dr. Ricciardelli will discuss your medical history and your realistic goals for any weight reduction if any. Dr. Ricciardelli will examine your areas of concern to determine the distribution of excess skin and fat. If you are currently trying to lose weight, he will discuss your realistic weight loss goals and how that might affect your surgery date. During your procedure localized fat may be liposuctioned and excess skin will be trimmed and re-draped to improve your arm contour. Dr. Ricciardelli will discuss the tumescent technique that minimizes discomfort and bruising, while make fat easier to remove. Dr. Ricciardelli makes every effort to make the smallest incision possible while giving you the result you desire. There are several different arm lift incisions that can be made, all with varying lengths. Dr. Ricciardelli will exam your degree of sagging to determine which incision will give you the results that you desire. Your privacy and safety are very important to us. On the day of your surgery you will park in a designated, convenience space in back of the Summit building close to the private back door entrance of our office. Your surgery will most likely take two to four hours in our AAAASF (Association for Accreditation of Ambulatory Surgery Facilities) certified operating suite. After the procedure, you will wake up in our warm and caring recovery suite. Our recovery nurse will make sure that you are comfortable and inform your designated driver when you are ready to return to the comfort of your own home that day. You will be given detailed instructions for your specific needs. Most patients do not complain of pain after surgery but a mild discomfort. You will most likely be wearing a compression garment for 2 weeks to reduce any swelling and improve the contour of the surgical area. On average, most patients are able to return to work in 1-5 days and begin light exercising in 2 weeks. A lot will depend on your level of activity at work. You will be seen back in the office after surgery. Expect to have possible bruising, swelling and tenderness after surgery. Dr. Ricciardelli will call you in the evening to check-in on your progress as well as see you back in the office for your post-operative visits. Our door is always open for any questions.